Star The Winner Is definitely kept the promise offered from the maiden episode of the show in July to deliver nail biting and intriguing experiences. 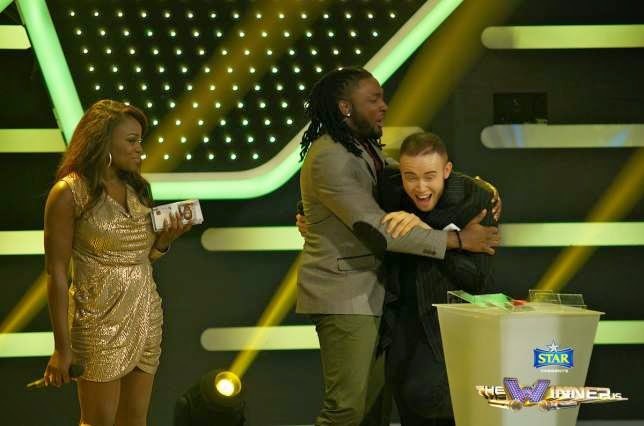 The reality show which is Nigeria’s first music game show, over the weekend presented the most epic climax to the maiden season of the show. After six semi finalists went against each other, the battle for the life- changing grand prize of 10 Million naira and a brand new car intensified in the final round finale with two great singers, Job Idoko and Micheal Achu delivering the best of their vocal chords to wear the much desired winning crown. The highlight of the night was presented when as usual after both contestants had proved their vocal prowess and it was decision time. As is the usual tradition on the show, both contestants were offered two million naira to walk away or way to see the 101 Jury results which would reveal who actually won the duel round and would be going home with a brand new car and 10million naira. the table, which automatically qualified Micheal as the winner of Star The Winner Is Season 1. Upon the reveal of the results, Job who had higher votes but had opted to walk away with Two Million Naira forfeiting his winning spot to his counterpart Micheal Achu. Fate and destiny definitely smiled on eventual winner Micheal Achu, as it would have turned a bitter experience for Micheal, if Job did not press the dreadful buzzer to walk away with Two Million Naira, Micheal would have gone home empty handed. Other impressive contestants on the semifinal show include Brenda, Rhema, Shimar, Daniel, and Roxy. Star The Winner Is fans and supporters nationwide went on a rampage on social media all expressing their thoughts on the most shocking results of all time. Oh dear, the Big Brother Africa show just started. I mean, the housemates just arrived, not up to 48 hours and someone is already getting her asz massaged. Lilian is Nigeria's female representative and she's really close to her Namibian housemate, Luis, which prompted her to ask him for a free massage all in the name of "physical therapy." All these butts they are sharing in BBA, #Diaris God oo. Anyways, continue to see more photos and watch the video after the cut..